Held at the UCLA Luskin Conference Center in Los Angeles from November 17-18, the California Heart Rhythm Symposium is a regional symposium focused on the latest advances in the field of cardiac arrhythmias (Atrial Fibrillation and Ventricular Arrhythmias). The one and one-half day Symposium was well attended and featured presentations by recognized leaders in the field. (I only attended the sessions on A-Fib.) 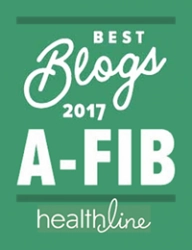 I attended as a journalist representing A-Fib.com. The following are 15 brief descriptions of the presentations that made the most impression on me. Dr. Greg Michaud from Vanderbilt described how recurrence rates have improved with the use of newer treatments such as contact force sensing catheters and CryoBalloon ablation (and the new Laser balloon). The focus now is where else to ablate besides the Pulmonary Veins (PVs). In his ablations Dr. Michaud tends to ablate or fill in the posterior wall with ablation burns. Dr. Jared Bunch of the Intermountain Heart Institute in Utah shocked the attendees with the statements: one in three of us will develop A-Fib in our lifetime; A-Fib doubles the risk of developing dementia; and Dementia has become the third leading cause of death in the U.S. He also pointed out that being on warfarin causes microbleeds in the brain which increase dementia. The younger you are when you develop A-Fib, the more likely you are to develop dementia. 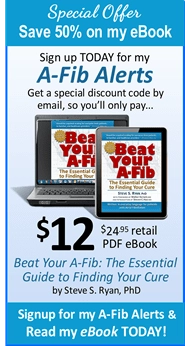 (See my article A-Fib Doubles Risk of Dementia.) But a catheter ablation reduces the risk of developing dementia to that of a normal person. Dr. Bunch gave the striking example of a patient who would speak normally when in sinus rhythm. But when he went into A-Fib, he lost the ability to speak because he was in dementia. Dr. Andrea Natale of the Texas Cardiac Arrhythmia Institute in Austin, TX, described his current ablation strategy. Of special note, he showed how ablating the Left Atrial Appendage (LAA) increases ablation success rates. During an ablation, he also concentrates on the posterior wall between the PVs. He also pointed out there is currently no standard, agreed-upon protocol for mapping and ablating non-PV triggers. Dr. Jocob Koruth of Mount Sinai Medical Center in New York described how contact force sensing catheters have lower recurrence levels. But CryoBalloon ablations seem more durable. He mentioned that the FIRM and CardioInsight ECGI vest systems have not been proven. Editor’s Comments: The FIRM system has received a good deal of negative press and research papers. See Firm Mapping System and FIRM Research. But the CardioInsight ECGI vest system, though very new, seems to have great potential. Dr. Kim Rajappan from Oxford University in Oxford, UK discussed A-Fib and A-Flutter. Both carry the same risks for patients. Rate control is harder for Flutter. Most EPs would do a Flutter ablation even if the patient were not in A-Fib at the same time. Editor’s Comments: Flutter can be considered as a milder or more organized form of A-Fib. It may feel slightly better than A-Fib and be better tolerated. But it’s still as dangerous as A-Fib. Dr. Luigi Di Biase of the Albert Einstein College of Medicine in New York echoed Dr. Natale in stressing the importance of the LAA (Left Atrial Appendage) in A-Fib. But he also pointed out the importance of measuring flow velocity out of the LAA after isolating it. If LAA flow velocity is low, it’s necessary to keep a patient on anticoagulants for life or remove the LAA such as by using the lariat device. He described how some surgical approaches to removing/closing off the LAA leave a stump which can still produce A-Fib signals and which may have to be isolated by a catheter ablation. He now uses the CryoBalloon to electrically isolate the LAA. He pointed out that rivaroxaban (Xarelto) must be taken with food. One Million Catheter Ablations Performed Yearly! Dr. Bradley Knight of Northwestern University in Chicago, IL showed how important and accepted catheter ablation is in treating A-Fib. Over 1 million catheter ablations are performed per year (as many as cataract surgery). Northwestern mostly uses CryoBalloon catheter ablation. Their success rates are 79% after one year, 72% after two years. He concentrates on the posterior wall of the left atrium. Editor’s Comments: Catheter ablation for A-Fib is a relatively recent discovery (1995/96). Catheter ablation is one of the most remarkable success stories of medical innovation. Few medical disease treatments have gained such wide acceptance in so short a time. 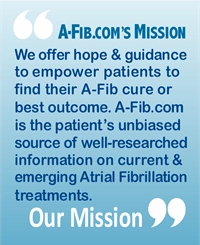 For a list of over 1000 EPs doing ablations in the U.S. alone, see our A-Fib.com directory. Dr. Eric Buch of UCLA discussed A-Fib and heart failure. Patients with heart failure seem to be predisposed to develop A-Fib. 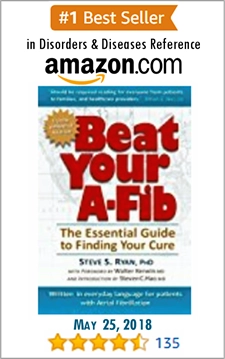 A-Fib contributes to cardiomyopathy (a form of heart failure). He cited studies where patients with heart failure and A-Fib improved 70% after a catheter ablation for A-Fib; 35% actually returned to normal. Dr. Buch stressed the need to perform a catheter ablation in heart failure patients with A-Fib as soon as possible. Dr. Melvin Scheinman of UC San Francisco gave a historical perspective on the development of catheter ablation which he cited as a treatment that can cure A-Fib (rather than just improve symptoms). He looked forward to future developments in A-Fib treatment such as non-invasive mapping and gene therapy. Dr. Sumeet Chung of Cedars-Sinai Medical Center in Los Angeles, CA, pointed out that 33.5 million people world-wide have A-Fib. A-Fib is becoming more critical in developing countries. Mortality and Sudden Cardiac Death (SCD) are rising particularly among women with low and medium income. 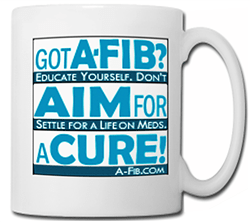 Much more effort and public health policy should be allocated to screening for A-Fib. Under Obamacare, there has been a 17% drop in SCD. Dr. John Mandrola of the Louisville Cardiology Group in Louisville, KY, discussed how doctors should take advantage of the new media rather than just publish in research journals. 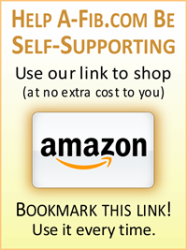 Dr. Mandrola has his own well-read blog which does that: http://www.drjohnm.org. He cited examples of researchers who published articles about A-Fib in medical journals, then translated the medical jargon into new media such as blogs, Twitter, Facebook, and even produced videos for YouTube. Dr. Eric Buch of UCLA presented a case of a 58-year-old man in asymptomatic persistent A-Fib. He exercised regularly especially hiking. He didn’t like taking meds. He had a cardioversion which only lasted for 12 days. During his time in sinus, he didn’t notice any difference in how he felt compared to when he was in asymptomatic A-Fib. His ejection fraction was only 35%, but this improved when he was on rate control meds (metoprolol). He had mild left atrium enlargement. Because of his young age, they didn’t think it was reasonable to leave him in A-Fib even though he was asymptomatic. Also, his ejection fraction was weak. and his left atrium was enlarging. Dr. Buch performed a catheter ablation (antral PVI) to restore him to sinus. He remains in sinus. This man had thyroid problems and had severe left atrium enlargement. He ejection fraction varied from 25%-50%. Though on warfarin, he had suffered a stroke and was in rehab. He had global hypokinesis (slow movement) A-Fib. Though on warfarin, he had suffered a stroke and was in rehab. He was sent for a Cox-Maze operation. After the Maze, he was in sinus for 7 days, then went back into A-Fib. Dr. Buch then performed a catheter ablation. He found that the surgery had isolated the PVs, but other areas had to be ablated. He has been in sinus for 4 weeks. Many doctors would have insisted she get a pacemaker. Dr. Buch performed a CryoBalloon ablation on her which was successful. Because her stroke risk score was 2, Dr. Buch told her she should be on apixaban (Eliquis) for life, even though she was no longer in A-Fib. She instead decided she didn’t want to be on a blood thinner for life, because of the danger of having a fall while biking as a triathlete. Editor’s Comments: Being Female Not a Risk Factor for Stroke: Recent research and current guidelines no longer rate women at higher stroke risk simply for being a woman. See Camm Stroke Risk Guidelines Changes and Being Female Not a Risk Factor for Stroke. Catheter Ablation Does Improve Mortality: Dr. Buch made a point which is disputed. He said that there is no proof that catheter ablation improves mortality. But research indicates otherwise. See Live Longer—Have A Catheter Ablation. The California Heart Rhythm Symposium included many of the same presenters and Atrial Fibrillation topics as the 2017 International AF Symposium held this past January (it’s like a mini-version of the symposium held in Orlando, FL). This regional conference offered updates on several reports I posted on A-Fib.com earlier this year. It was also an opportunity to network with some of the country’s top cardiologists and electrophysiologists. Well worth the drive across town! New Research into Alcohol & A-Fib: How Many Drinks are Too Many?